I'm hardly an expert when it comes to make up. In fact, my makeup routine is probably pretty boring! I tend to go for a natural, glowy look that's suitable for day or night. I have small eyes and short lashes (sigh) so I like to use products that give the illusion of big eyes and full lashes. 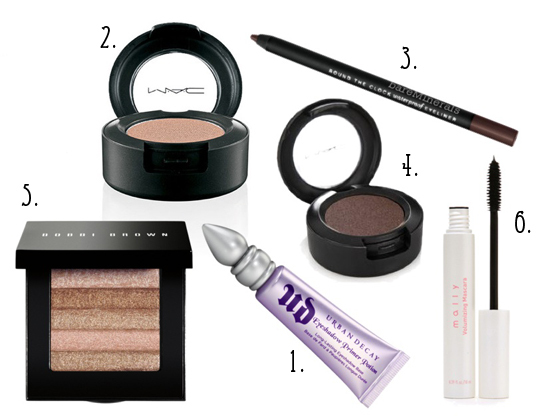 When it comes to shadow, I gravitate towards warm colors that bring out the green in my hazel/green eyes. Since I love trying new products, I'd love to know what you wear on your eyes. Do tell! 1. Urban Decay Eyeshadow Primer - This stuff will make your shadow stay put all day long. 2. MAC "Jest" eyeshadow - The perfect shimmery/peachy color for all over the lid. 3. BareMinerals eyeliner in "7pm" - Glides on effortlessly and lasts all day. 4. MAC "Satin Taupe" eyeshadow - I use this in the crease of my eyes to make them pop. 5. Bobbi Brown Shimmer Brick - I love adding a swipe of shimmery shadow just under my brow bone. Plus, the colors can be worn alone or blended together as eyeshadow, blush or an all over face/body shimmer. 6. Mally Volumizing Mascara - I probably sound like a broken record at this point, but this really is THE best mascara EVER. The bobbi's eyeshadows are really perefct! i swear by the UD Primer Potion - works like a charm! You should definitely do a post on your make-up routine! I personally love to know what products other women use!